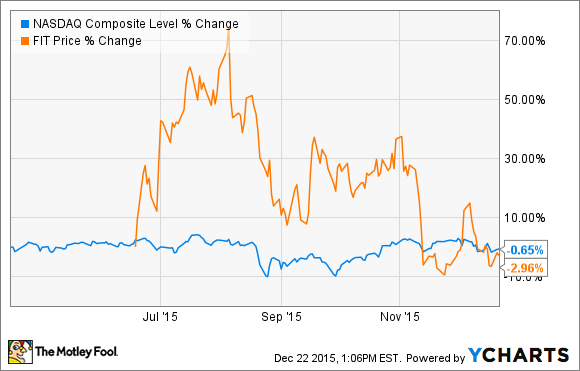 Will 2016 Be Fitbit Inc.'s Best Year Yet? FitBit appears poised to grow profits considerably in 2016, but competitive threats from the likes of the Apple Watch still loom large. For all the promise 2015 held, investors in fitness-tracking leader FitBit (NYSE:FIT) find themselves back at square one as we close out the year. As competitive reality set in at midyear, the irrational euphoria baked into recent consumer-electronics IPOs led to a reversal of fortunes among the likes of FitBit and GoPro. However, with plenty of potential still before it, 2016 could prove to be the best year yet for FitBIt. The roughly 40% decline in FitBit since early August makes the stock a much more attractive option for potential buyers today. It's not a steal, but it arguably offers a reasonable value for investors who believe in the company's long-term growth plans and willing to hold on to the stock. Here's a quick overview of FitBit's various trading multiples at the time of writing. Source: Yahoo! Finance. LTM = last 12 months; NTM = next 12 months. Although forward estimates always deserve a healthy dose of skepticism, the price-to-earnings ratio of 48 does look high, especially against the S&P 500's current 21. But FitBit appears likely to benefit from a fair degree of operating leverage in the upcoming year, which will drive profit growth well in excess of its top-line sales expansion. Looking several years out, market researcher IDC predicts that the market for so-called "basic wearables" such as many of FitBit's fitness trackers should increase from an estimated 22 million last year to over 66 million by 2019. IDC also sees FitBit and Xiaomi as the central drivers of this trend. These kinds of heady growth estimates jibe with analysts' estimates that FitBit will grow its EPS at an annual average rate of 32% over the next five years. Should that prove the case, FitBit's current multiples will have proven a bargain hiding in plain sight. However, there's still plenty of reason for skepticism as well. The digital camera circa 2007? I like a lot of what FitBit offers consumers. I've owned fitness bands in the past, and I fit within its target consumer profile. And while I'm intrigued by a few of its offerings, I'm equally concerned that upcoming versions of the Apple (NASDAQ:AAPL) Watch or other smartwatches will eventually render FitBit obsolete. The iPhone's disruption of multiple consumer-electronics categories deserves mention here. The phone wasn't revolutionary because it invented any of its functionalities. Before its 2007 launch, digital cameras, MP3 players, cell phones, and even lesser smartphones already existed. However, the iPhone packaged each of those tools into a single product whose overall utility vastly exceeded the sum of its parts. The same scenario could well play out for single-use wearables such as FitBit's fitness trackers. To its credit, FitBit has done an admirable job responding to the competitive threat from the Apple Watch and others. Specifically, its ChargeHR and Surge devices offer fitness features that match or exceed those of leading smartwatches -- including the Apple Watch. Both Apple and FitBit are reportedly working to integrate deeper biometric monitoring hardware into their respective devices, setting the stage for something of an arms race as the wearables category continues to expand in the years to come. So while all signs point to 2016 being FitBit's best year yet, the existential threats to today's leading fitness-tracking brands over the long term loom large, at least for now.